No matter what stage in your evolution you are at now, this workshop is designed to catapult you onto your Divine Path with all the tools you need to fully embody a self-love practice. This is a 7-week journey into your unique patterning, relationships, and life purpose to create the life you are meant to live. Sign up for our newsletter to be the first to know when this new event is live and registration is open! Celestial Sisters & Sridaiva Wellness come together to offer energy healing, intuitive readings, and conscious communication to online platforms. Be sure to follow us on Facebook and Instagram for live videos, conscious coffee talks, and more! Drop-in ThetaHealing sessions at a discounted rate. Go online or call Sacred Energy to reserve your time. Drop-ins also welcome! Click the button below to be redirected. For Jaelyn, yoga has been a primary key to unlocking her inner potential. It is her honor to share it with the world in a meaningful, developed practice that marries the fundamentals of yoga, mindfulness meditation, and teachings from a variety of cultures. 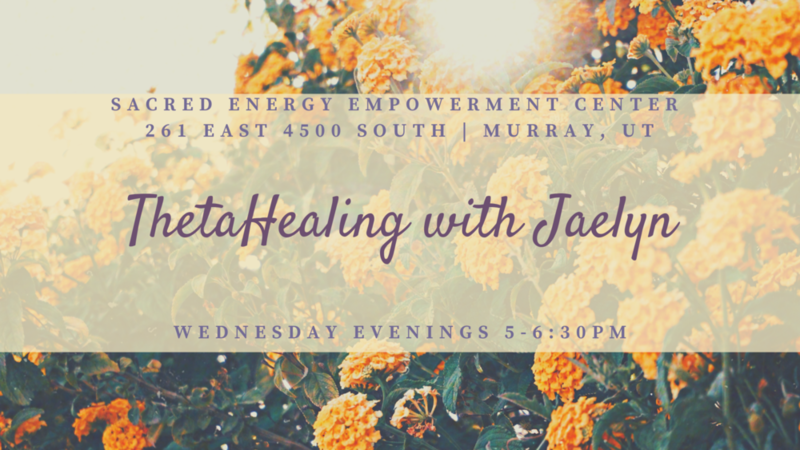 Begin healing your mind, body, and soul with Jaelyn through an incredibly powerful energy-healing modality. Together we can identify, release, and reprogram subconscious beliefs that are holding you back from reaching your highest and best self, and from living your best life possible. Any and all illnesses, from diabetes to disorders and everything in between, has the potential to be cleared through utilizing the Theta brainwave and connecting with the energy of All That Is. The best way to start adding tools to your spiritual toolbox. Join Celestial Sisters for events that intend to raise vibration, spread awareness, increase well-being, and come together in community for a fun way to create some change. See what's the latest inspiration to Jaelyn's blog. What a blessing to breathe a brand new breath of fresh life. The wheel of the year has turned once again towards the light, and life that has been stagnant, deep in slumber, is awakening in a beautiful display of resiliency. During this retrograde motion, we are invited to look further inward at our own beliefs and spiritual path, and the areas where we live by our own inner guidance, that are distinct from society. Connecting with a Libra moon, we are intuitively seeking a partner that could help expand our own inner belief systems and faith. Sagittarius’ role in this is to create an opportunity to explore beliefs, spiritual knowledge, and that which takes us far - a relationship that truly means something. The medicine of this month is all about movement; we have done the inner Work, with a capital ‘W’, through the stillness and introversion of winter and are now invited to crack open the seeds and move our energy towards the Light. Take a six month or one year journey with Jaelyn to illuminate your shadow aspects, engage with your mind-body,discover secrets from your past lives, and add to your spiritual toolbox. This package is the key to unlocking your subconscious blocks and the beginning to a new, fulfilled life that you deserve. Sign up and receive a FREE personalized card reading delivered straight to your inbox. Celestial Circle brings positivity to your email. Be the first to know about new offerings, discounts, and more when you join the Circle. Thank you for making the decision to have conscious communication via your inbox! We look forward to having you in the Circle. All Rights Reserved. Celestial Sisters 2019.